Shop Insurance says the City of Toronto endured a month's worth of rain in less than three hours on Tuesday as a "pocket storm" hit the region. (PRLEAP.COM) Shop Insurance says the City of Toronto endured a month's worth of rain in less than three hours on Tuesday as a "pocket storm" hit the region. Toronto saw a high level of rain in a short period of time, according to a recent report from Environment Canada. 50 to 75 millimeters of rainfall hit Toronto according to weather radar. To become a catastrophe event in insurance terms, there must be at least $25 million in property damage. At this point, it is unclear whether the pocket storm will classify as a Cat event. However, claims are incoming following the storm. ClaimsPro says the majority of claims resulting from the storm came from personal sewer back-up and flooding, with few commercial claims. Ontario has suffered several weather events this year, and an accumulation of non-cat events "definitely put strain on capacity and resources available to assist insureds in a timely fashion," Kumar Sivakumaran, vice president of national operations for ClaimsPro, told Canadian Underwriter. 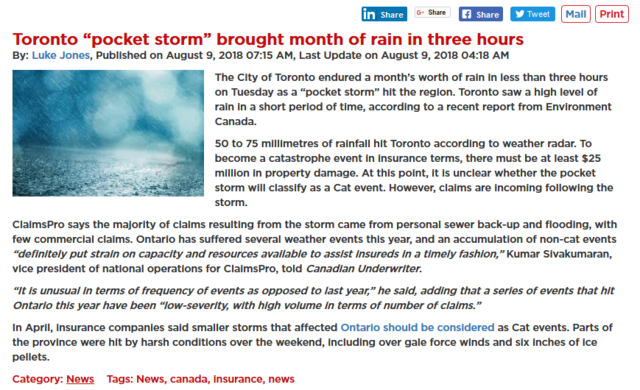 "It is unusual in terms of frequency of events as opposed to last year," he said, adding that a series of events that hit Ontario this year has been "low-severity, with high volume in terms of number of claims." In April, insurance companies said smaller storms that affected Ontario should be considered as Cat events. Parts of the province were hit by harsh conditions over the weekend, including over gale force winds and six inches of ice pellets.